Alabama School Connection » Do Your Kids Need Cash for College? Do your kids need cash for college? Are your kids completing the free application for federal student aid, a.k.a. the FAFSA? Kristina Scott, Executive Director of Alabama Possible, joined me on the Get Connected segment of the Alabama Way recently to talk about their Cash for College initiative. Alabama Possible is a nonprofit organization working to reduce systemic poverty and its root causes through partnerships with higher education institutions and other community organizations. Scott is passionate about helping students get to college, and knows that the worry about the cost of college can keep college seniors from even applying for college. Scott found that most of the kids they work with through Alabama Possible don’t have a plan to pay for college, and that until they learn what resources are available, they don’t know how to make that dream of going to college a reality. According to the Alabama Commission for Higher Education (ACHE), the median cost of tuition and fees to attend an in-state 4-year public college in 2015-2016 was $9358, while those same costs for a 2-year in-state college were $4320. Completing the FAFSA is the first step to becoming eligible for federal student aid. Financial aid is available in the form of grants, student loans, and other forms of aid. Pell Grants are the most well-known grants, and for the 2015-2016 award cycle, the maximum available was $5,775. Scott sees completing the FAFSA as the first step to enrolling in college, as nine out of 10 students who complete the FAFSA attend college the following fall, according to Scott. A recent analysis from NerdWallet estimated that Alabama’s high school graduates left $58.7 million on the table in Pell Grants for the 2015-2016 school year. That’s more than $2,200 per Alabama high school graduate. The Cash for College initiative aims to help counselors and educators in Alabama’s high schools get familiar with the FAFSA, as they have the most contact with high school seniors and . The deadline for high schools to participate in the Cash for College initiative was January 29, but high schools can still reach out to Alabama Possible for resources. High school seniors should talk with their high school counselor to ask for help and resources to complete the FAFSA. If your child’s counselor is unable to offer any help, Alabama Possible offers resources directly to students trying to figure out how to complete the FAFSA. Completing the FAFSA is a logical first step to figuring out if your family can afford college. Not only will you learn what type of federal financial aid your child might receive, but some colleges require students to complete the FAFSA in order to qualify for financial aid offered directly from the college itself. Rumors abound about how difficult the FAFSA is to complete, but on average, it only takes first-time applicants anywhere from 20 to 55 minutes to complete. Here’s a series of easy-to-understand videos about the whole FAFSA process. Note, too, that you do not have to have already filed your income tax return for the current tax year prior to completing the FAFSA. You can use last year’s tax information as an estimate. Once you file your income tax return, you can update your FAFSA. There is even a “data retrieval tool” that will pull your information directly from the Internal Revenue Service database. Many folks question whether they bring in too much income to qualify for any sort of financial aid. Financial aid is made available based on a student’s Expected Family Contribution, or EFC. If you want a better grasp of what your family’s EFC might be, check out this calculator. FAFSA filing for the 2016-2017 cycle (academic school year) opened on January 1, 2016. Most colleges have a March 1 deadline, which they consider a “priority” deadline where they look at awarding college-based financial aid. Remember, there are two pots of money: one is federal, and the other is college-specific. All applications for the 2016-2017 cycle must be completed by June 30, 2017. 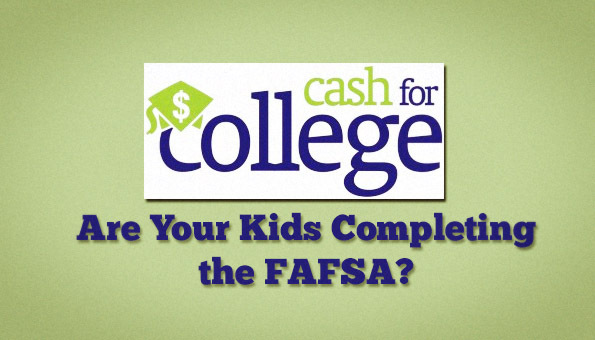 The U.S. Department of Education (USDOE) provides information on FAFSA completion by high school. That information is depicted in the table below. Some states’ graduates apply in higher percentages than others. This map from 2014 shows that only 47% of Alabama’s seniors applied for financial aid, where more than 60% of New York’s students applied. This article shares some of the reasons why some states’ graduates apply in higher numbers than others.